TRADER 9: Trade of the day, UEPS!!! WARNING!!! Never try this type of trading on above picture. Anyways, I have a rule that if I get stop-out on the same stock 3 times in the same day, I just call it quits. This had happened to me 9 times this year of over 500 trades so far I've had since January 1, 2012. Here are the bullet points on all 3 trades for UEPS. Three strikes and your out!!!! 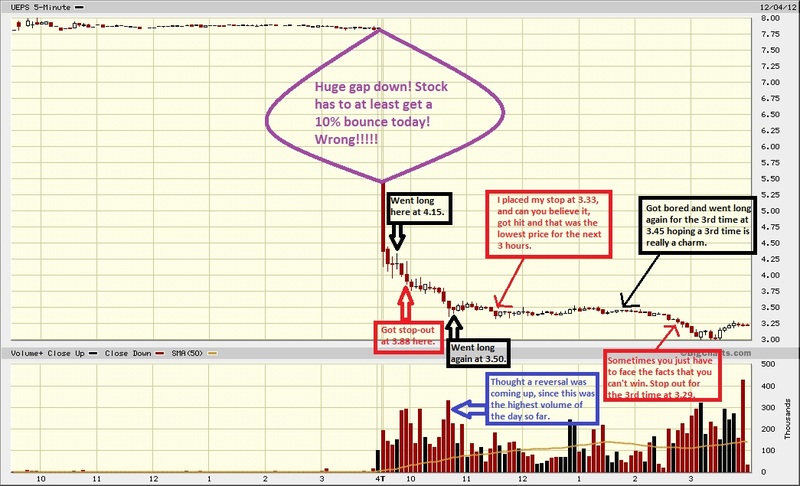 You should never fight the tape out of boredom, or you'll end up losing $600 on just one stock I wish never pop-up on my screen today. Usually my trades of the day are winning trades, but I had no winning trades today. I was struggling with this one all day. Considered shorting at 4.18 around 9:50 figuring that was the dead cat bounce, then wanted to go long around 1PM but it couldn't break through 3.50. At the end of the day, I backed off even though it started to fade. Sometimes not losing any money is enough for the day. @GCF Yep, but I got stupid and kept fighting for that bounce. @Anonymous, I also laughed at this trade at the end of the day.